Home » Starting BJJ » What is Brazilian Jiu-Jitsu? Brazilian Jiu-Jitsu (BJJ) is a martial art that specializes in grappling and ground fighting, especially submission holds like chokes and armlocks. To understand why, read Why does Brazilian Jiu-Jitsu focus so much on grappling and ground fighting? BJJ rose to international prominence in the 1990’s after Royce Gracie’s success over other martial arts styles in the original Ultimate Fighting Championships (UFC). BJJ continues to play a prominent role in modern mixed martial arts (MMA), and many MMA champions are also BJJ black belts. You can read more about BJJ in MMA here. Over the two decades since the first UFCs, BJJ has spread throughout North America, Europe, Asia, Australia, and the rest of the world. Most major cities in the USA now have BJJ schools run by black belts. Rural areas may have limited access to qualified BJJ instructors, though. You can get help finding a BJJ school here. As the name implies, Brazilian Jiu-Jitsu was developed in Brazil, most famously by the Gracie family. A Japanese judoka named Mitsuyo Maeda emigrated to Brazil in 1914, and soon after began teaching the art (then called Kano Jiu-Jitsu) to a young Carlos Gracie. Carlos taught his brothers, including Helio Gracie, who is often considered the founder of modern BJJ. Carlos and Helio in turn taught their many sons, who have carried on the tradition. You can read more about the history of BJJ here. The Gracie family is famous for fighting in challenge matches against other martial arts throughout the past century. Helio Gracie’s oldest son, Rorion Gracie, founded the UFC for the purpose of showcasing his family’s jiu-jitsu. Many Gracies have fought in vale tudo (no-holds-barred) and MMA, including Royce, Royler, Rickson, Renzo, and more. Because of its connection to the family, Brazilian Jiu-Jitsu sometimes goes by the name Gracie Jiu-Jitsu (GJJ). This is mostly for branding purposes, as only a few members of the Gracie family have the legal right to use the Gracie name. Learn more at What’s the difference between Gracie Jiu-Jitsu and Brazilian Jiu-Jitsu? Brazilian Jiu-Jitsu is traditionally trained in a uniform called a gi or kimono, similar to that of judo. You can get help buying a gi here. BJJ is also done no-gi. The merits of training gi or no-gi are often debated, which you can read about here. No-gi is usually more popular with those coming from a wrestling background or those who want to fight in MMA. The five main belts in BJJ are white, blue, purple, brown, and black. 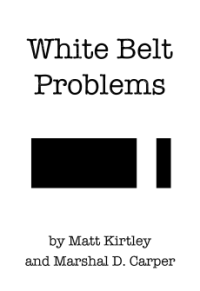 Certain black belts eventually earn red-and-white, red-and-black, and ultimately a red belt. On average, it takes 10 years to earn a BJJ black belt, which is much longer than most other martial arts. BJJ belt ranks and promotions are explained here. Brazilian Jiu-Jitsu has its own grappling tournaments. Smaller local tournaments are common. The largest tournaments, such as the Mundials (World), attract thousands of competitors of every belt rank from all over the world. The International Brazilian Jiu-Jitsu Federation (IBJJF) organizes the biggest and most popular BJJ tournaments. Most BJJ tournaments use a point system that rewards gaining dominant positions, and matches can be won by submitting the opponent. Strikes are not allowed. A few tournaments are submission-only, with no points system. You can learn more about BJJ competition here. The Abu Dhabi Combat Club (ADCC) is the highest level no-gi submission grappling tournament, and it has routinely been won by BJJ black belts. Brazilian Jiu-Jitsu teaches self defense, though many schools focus on the sporting aspects after the beginner’s level. How much self defense is emphasized varies between schools, though certain associations are better known for it, such as the Gracie Academies. You can read about BJJ for self defense here. Brazilian Jiu-Jitsu emphasizes regular live sparring. As a grappling art, sparring can be done at near full speed and force. This builds experience and develops traits that are important in hand-to-hand combat that can’t be gained through only practicing moves against compliant partners or memorizing patterns, as is too commonly done in traditional martial arts. To learn why this is so important, read What makes a martial art effective? That covers most bases! Keep reading through this site to learn more, or ask your own question!